As previously hinted, here are a handful of orcs I painted recently. 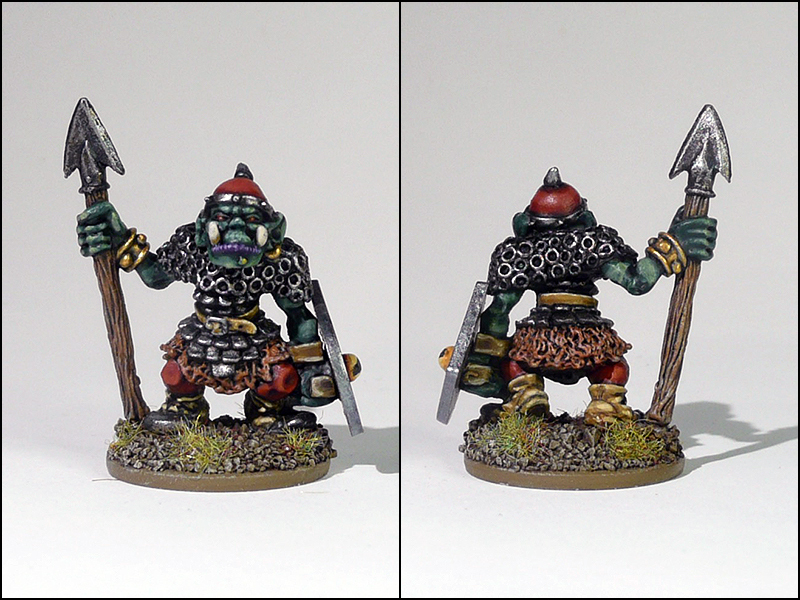 They’re actually the first dent I make in my enormous orc collection. 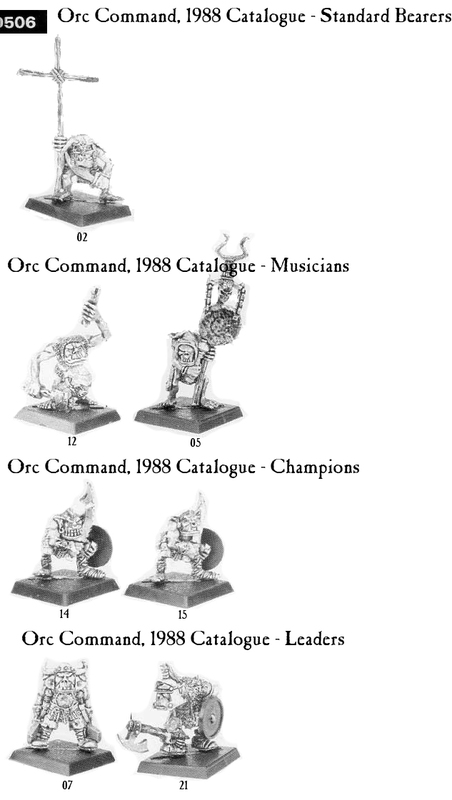 I’ve been collecting Citadel orcs with the 1988 Catalogue as a checklist. 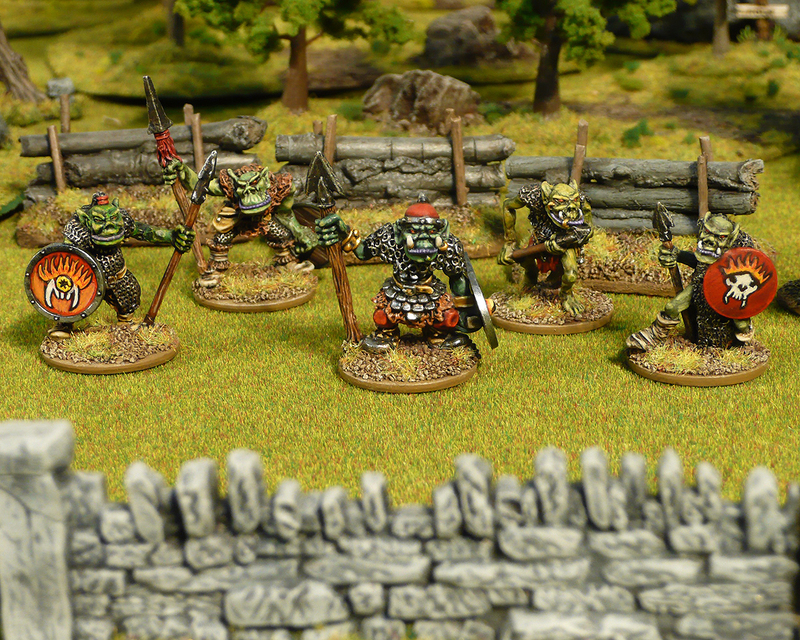 I have all the orc warriors, big ‘uns and Harboth’s (and all other Regiments of Renown with orcs). 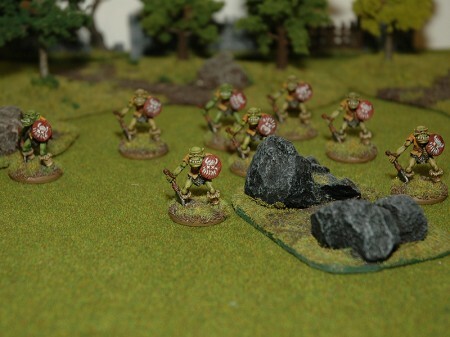 I lack a few of the dual weapons and pole arms, some archers and a few command. 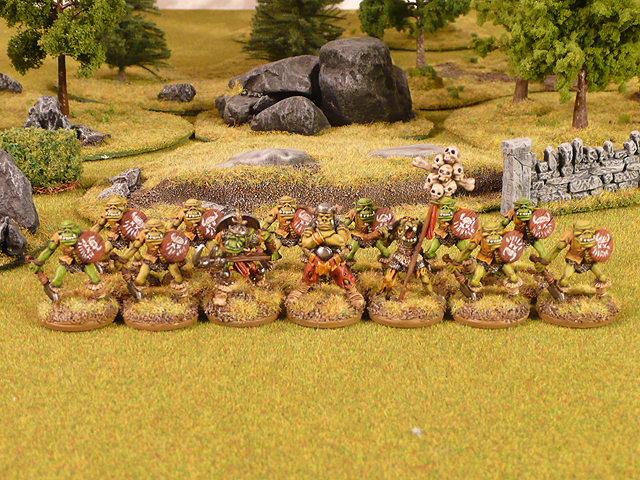 The boar riders and savage orcs I have barely started, while the villagers and crossbowmen are completely untouched. 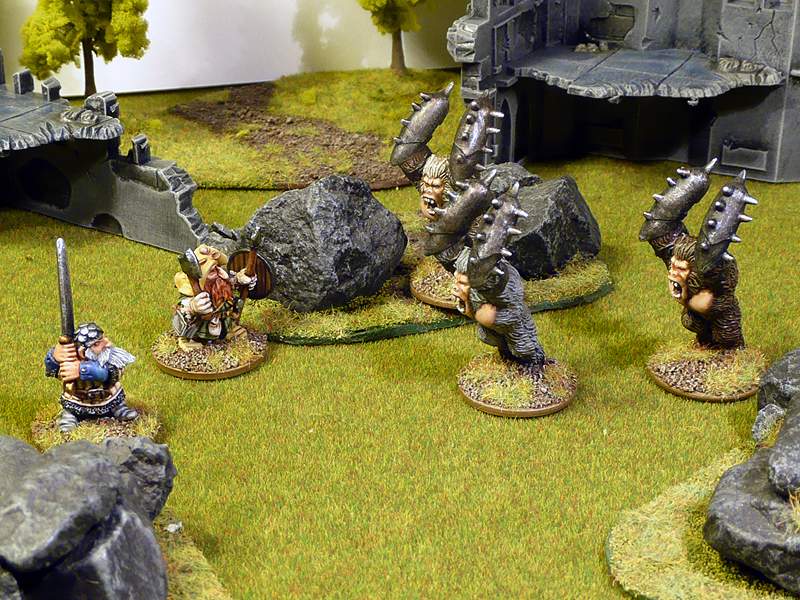 A while ago, Martin asked me if we should have a go at some Orc’s Drift. 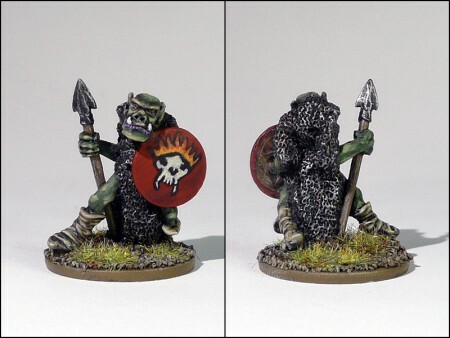 I (foolishly) said yes, and offered to paint the orcs. 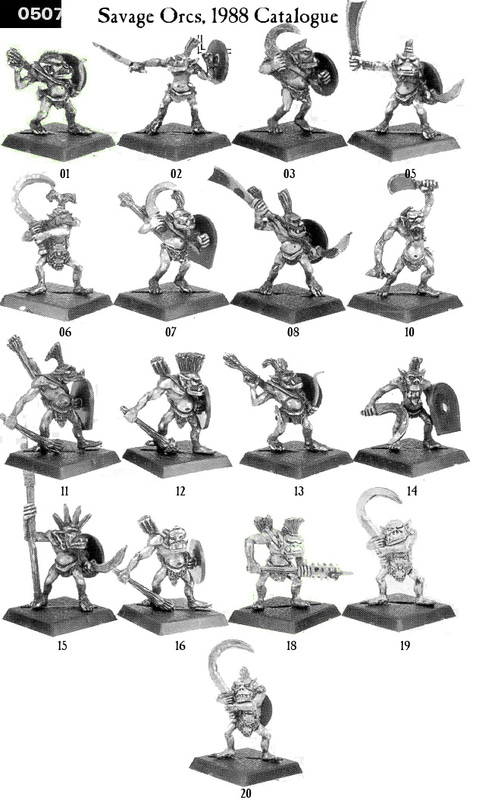 Here are the first five of the Vile Rune tribe. They were supposed to be an entry in the LPL this year (which I didn’t participate in). 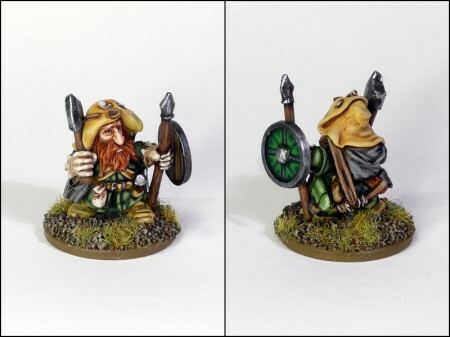 Nobrot and his spear boys have pledged allegiance to Fangor Gripe, thus adorning their shields with the Vile Rune burning skull motif. I tried a (for me) new approach when painting these models. In order to speed things up (the Vile Rune tribe alone is 40 orcs strong, and then there are the Severed Hands and Kwae Karr tribes) I decided to try pre-shading. 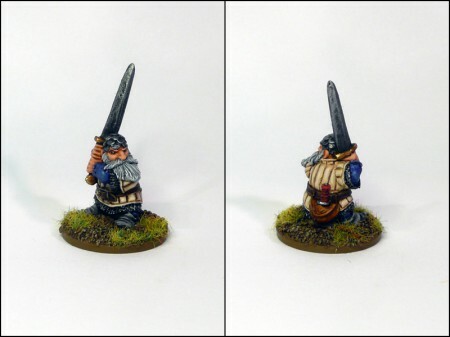 I primed the ladz in a mid gray, washed with black wash and drybrushed them white. Then, using thinned paints and matte medium I could shave a little bit off the painting time. 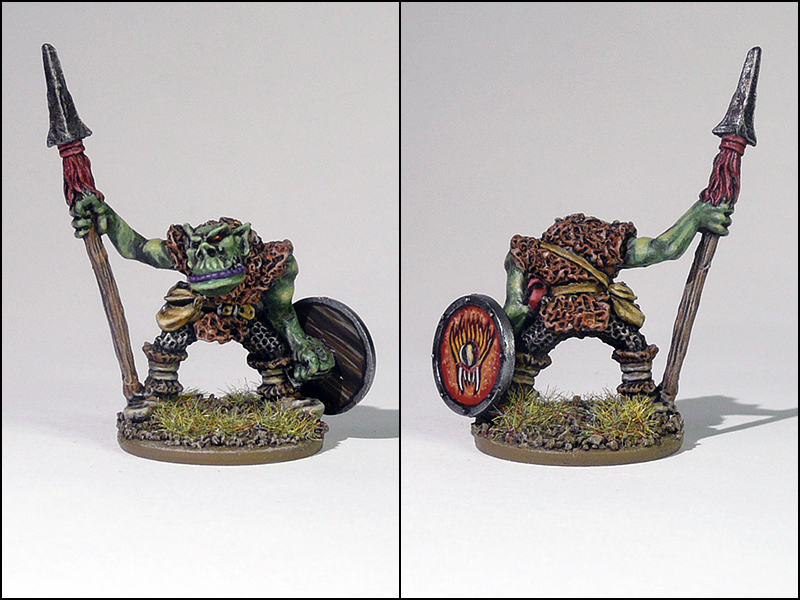 I’m not sure the prep work justified the time saved, but I liked the experience and the end results well enough. Also, a small disclaimer of sorts. 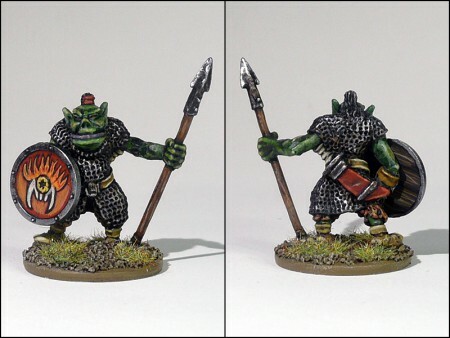 I like my orcs green. Not going to apologize for that. I also love the puntastic names (Bagrash!) 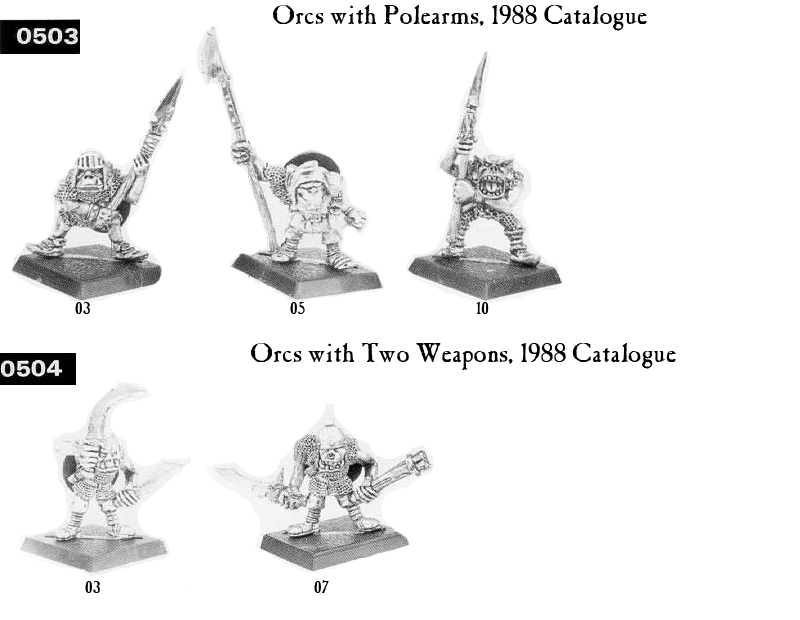 of the mid 80’s and the mockney “Oi, ladz!” type of personas so if you’re allergic to typical GW orcs you’re in the wrong place. Initially, I dreaded painting all those shields (the Vile Rune tribe warriors come with a hand weapon and shield) – but after a first stumbling attempt (see Shield Bearer above) I found it a nice challenge to do variations on the motif found on the force chart sheets in the scenario box. 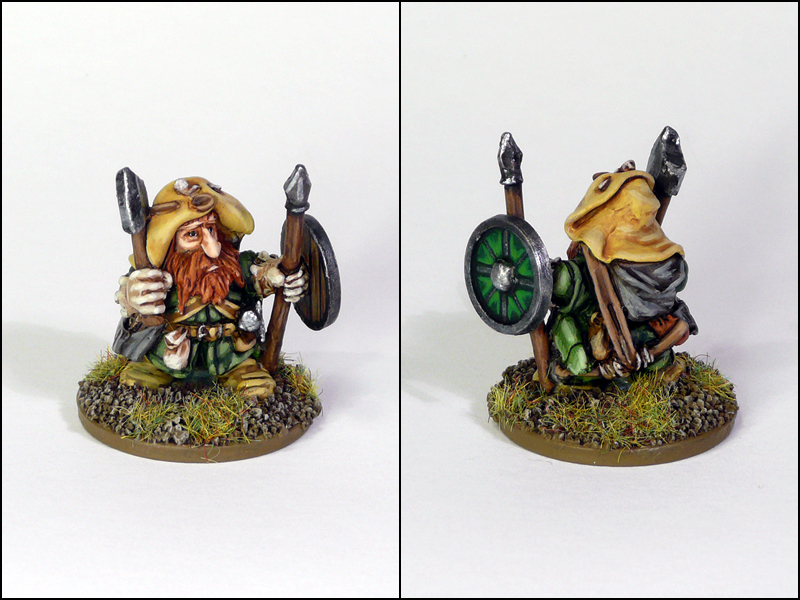 I’m not very skilled at freehand so it’s all a bit ham fisted in comparison to others out there. 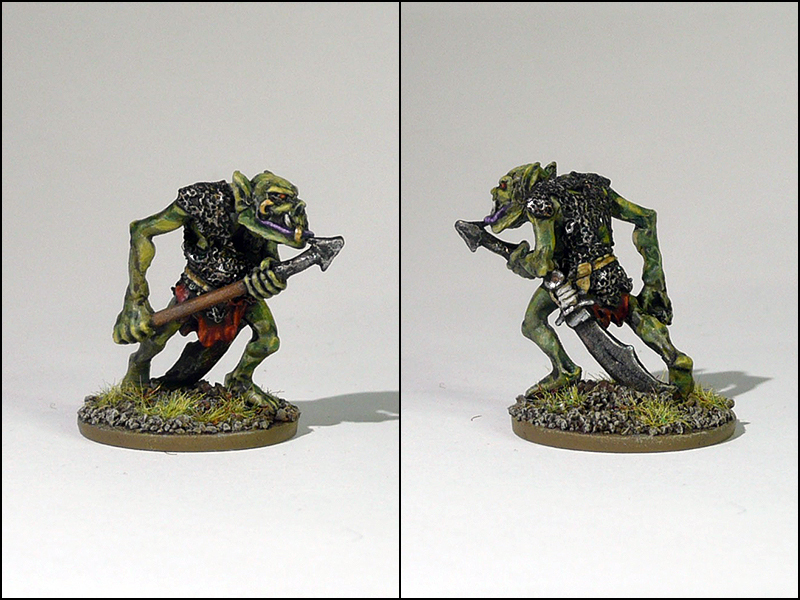 Also, I decided against shading the bone etc – after all they’re orcs. 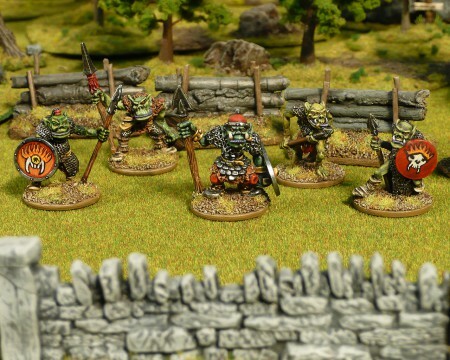 They just want flaymin skulz! 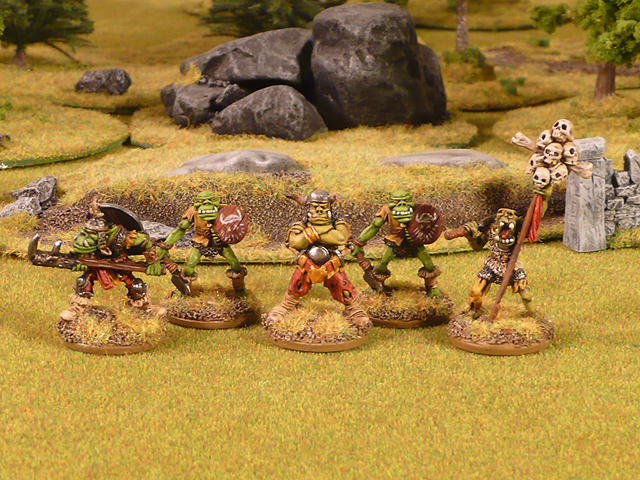 The next lot of 5 I do, I’ll include a group shot of the Vile Rune tribe and a few reference photos of their banners from the box. 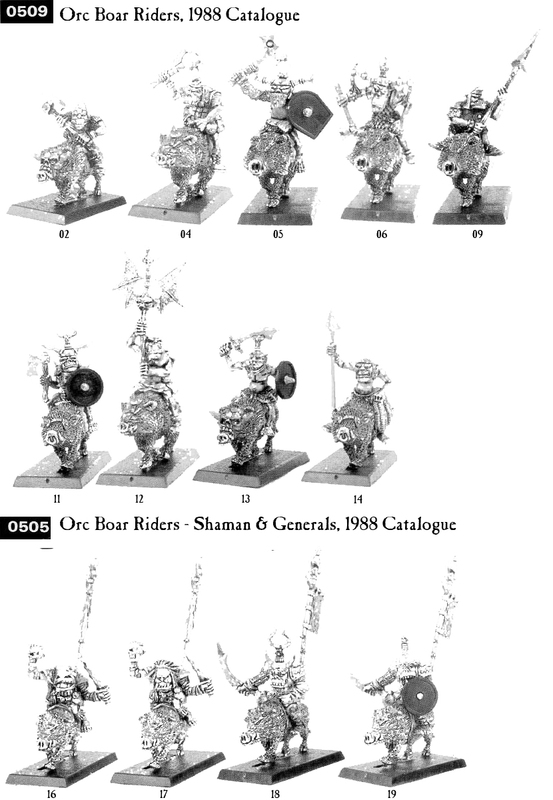 I managed to draft the whole tribe of 40 from the Orc Warriors pages 0501 and 0502, only having to add a few boys from other ranges. 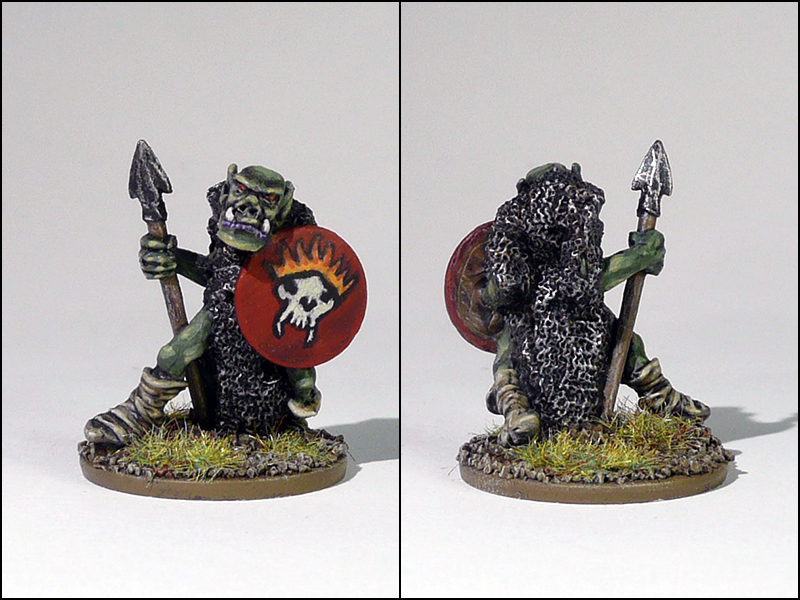 Hence the Talisman orc above.